“An engagingly written, imaginatively illustrated history of the river which rises in the heights of Upper Norwood to wind its way eventually into the Thames at Vauxhall Bridge." London was once a city awash with watercourses. Most of these streams and small rivers have long since disappeared underground and their void has been filled by myth, legend and an enduring yet uncertain fascination. The River Effra was one of these vanishings. In its earlier existence above ground it could only ever have been a modest tributary of the Thames, but through a vivid subterranean afterlife it has continued to impose itself on South London’s development history and local mythology. Once fringed by willows and water meadows, it was the haunt of salmon, eels and herons until it fell victim to the unregulated development of suburban South London. The Victorian housebuilder and his tenants enthusiastically transformed it from a small river into a large sewer until finally in desperation it was covered up. Yet it still flows… and occasionally floods. 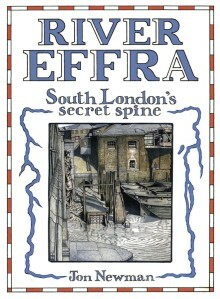 River Effra: South London’s Secret Spine is the first comprehensive account, beginning with its underlying geology and pre-history and continuing through to the river’s ongoing significance today. The machinations of medieval landowners seeking to divert its course are uncovered along with some of the more absurd legends concerning Canute, Queen Elizabeth and others. For the Victorians it was a public health disaster in waiting and its ignominious disappearance underground into London’s main drainage system in the 1860s was seen as a triumph of nineteenth-century civil engineering. In the twenty-first century its legacy is being approached anew. Richly illustrated with archival images and crisp contemporary black and white photographs, which combine to reveal its vanished stream, River Effra combines geography and geology with social, environmental and engineering history and sets this alongside a detailed walker’s itinerary for anyone needing to follow the ghost of this watercourse from Norwood, through Herne Hill, Dulwich and Brixton to Kennington and Vauxhall. Jon Newman is a writer and archivist and works in London.